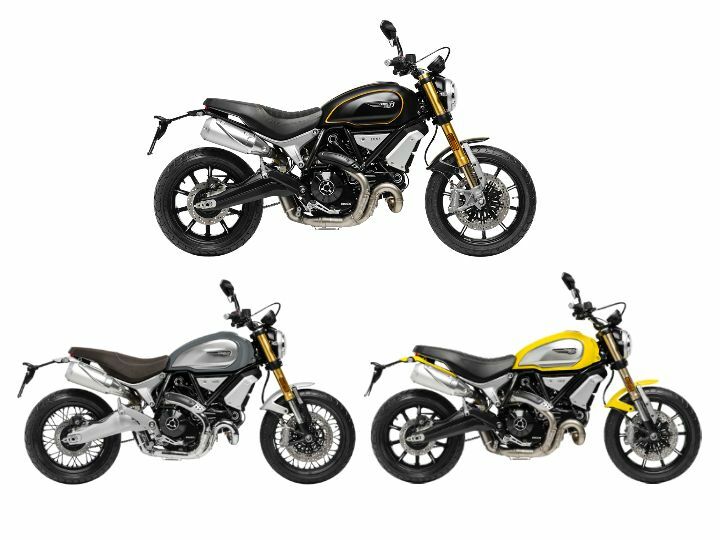 Ducati has launched not one, but all three variants of the Scrambler 1100 range in India. These include the standard, Special and Sport variant. With these three bikes, the Scrambler now offers a good alternative to the more exclusive BMW R nineT Scrambler (read the Ducati Scrambler 1100 Sport vs BMW R nineT Scrambler spec comparison here). Mechanically, all three versions share the same engine, power figures, as well as electronic aids. They do get some different suspension components though. Here’s what you need to know about these three variants. The Scrambler 1100 gets a lot of interesting cosmetic touches in the form of interchangeable aluminium side panels on the fuel tank and machine finished aluminium engine covers. It comes in two colours: 62 Yellow and Black. Despite being a base variant, the Scrambler 1100 comes packed with features like LED lighting, underseat USB charging port and a new digital instrument console that shows almost all engine and electronics data. Its 1079cc air- and oil-cooled L-twin motor makes 86PS at 7500rpm and 88Nm at 4750rpm. It comes mated to a six-speed gearbox with a slipper clutch. Electronic aids include ride-by-wire, three power modes, 4-stage traction control and cornering ABS. Its tubular steel trellis frame gets fully-adjustable Marzocchi 45mm upside down front forks and Kayaba rear monoshock adjustable for preload and rebound damping. The 10-spoke lightweight alloy wheels come wrapped in Pirelli MT 60 RS radial tyres. Braking is via 310mm front discs clamped with Brembo M4.32 monobloc calipers and a 245mm rear disc. For Rs 21,000 more, you can opt for the Scrambler 1100 Special. It gets the same cosmetic enhancements as the standard variant as well as additional ones in the form of front and rear aluminium mudguards, anodised aluminium fuel tank side covers, chrome exhaust pipes as well as brushed aluminium finish on the swingarm. It also gets a unique Custom Grey paint job, lower handlebars and a different seat cover. The suspension and brake components are similar to the base Scrambler 1100, but it does get black-painted spoked aluminium wheels for a more retro touch. The spoked wheels seem to add extra weight as the bike weighs 211kg (kerb), 5 kg more than the standard and Sports variant, both of which use alloy wheels. The top-of-the-line Scrambler 1100 Sport commands a Rs 51,000 premium over the base Scrambler 1100 and a Rs 30,000 more than the Special variant. It gets a black paint job called Viper black, with two racing stripes running down the centre of the bodywork. Other cosmetic touches include black aluminium fuel tank side covers and a black exhaust heat shield. It also gets lowered handlebars and sporty looking new seat covers. While the cosmetic touches might not be enough to justify the Rs 30,000 premium, the Scrambler 1100 Sport gets a major suspension upgrade in the form of front 48mm Ohlins upside down forks and rear preload and rebound damping adjustable Ohlins rear monoshock. To add to the sporty nature, it gets machine cut alloy wheels. Of the three, the Scrambler 1100 Special sits at a precarious position. At Rs 20,000 extra over the standard scrambler, you get a few cosmetic updates and spoked wheels. We’d recommend you pay Rs 51,000 more over the standard variant and go for the Scrambler 1100 Sport as the Ohlins suspension setup in itself is worth the extra premium. Or, the standard Scrambler should do fine as well since it gets fantastic kit to begin with.